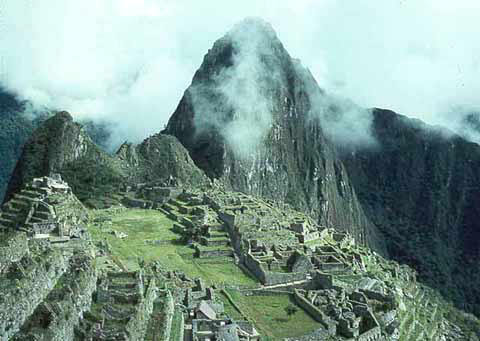 Machu Picchu lies in the southern hemisphere, some 13 degrees south of the equator. It is 80 kilometers northwest of Cusco, on the crest of the mountain Machu Picchu, located about 2,450 metres (8,040 ft) above mean sea level, over 1,000 metres (3,300 ft) lower than Cusco, which has an altitude of 3,600 metres (11,800 ft). As such, it had a milder climate than the Inca capital. It is one of the most important archaeological sites in South America, one of the most visited tourist attractions in all of Latin America and is the most visited tourist attraction in Peru. 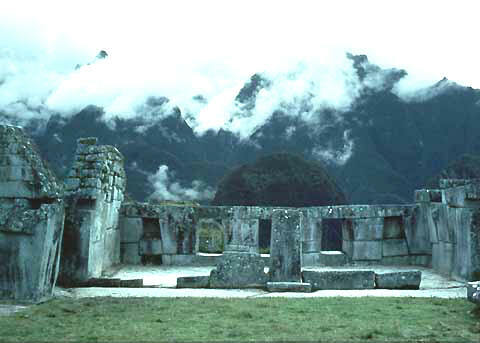 The central buildings of Machu Picchu use the classical Inca architectural style of polished dry-stone walls of regular shape. The Incas were masters of this technique, called ashlar, in which blocks of stone are cut to fit together tightly without mortar. The Incas were among the best stone masons the world has seen, and many junctions in the central city are so perfect that it is said not even a blade of grass fits between the stones. 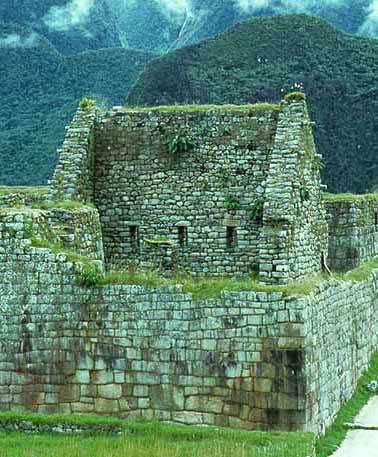 Inca walls show numerous design details that also help protect them from collapsing in an earthquake. Doors and windows are trapezoidal and tilt inward from bottom to top; corners usually are rounded; inside corners often incline slightly into the rooms; and "L"-shaped blocks often were used to tie outside corners of the structure together. These walls do not rise straight from bottom to top but are offset slightly from row to row. The Incas never used the wheel in any practical manner. Its use in toys demonstrates that the principle was well-known to them, although it was not applied in their engineering. The lack of strong draft animals as well as terrain and dense vegetation issues may have rendered it impractical. How they moved and placed enormous blocks of stones remains a mystery, although the general belief is that they used hundreds of men to push the stones up inclined planes. A few of the stones still have knobs on them that could have been used to lever them into position; it is believed that after the stones were placed, the Incas would have sanded the knobs away, but a few were overlooked. The space is composed of 140 structures or features, including temples, sanctuaries, parks, and residences that include houses with thatched roofs. There are more than one hundred flights of stone steps –often completely carved from a single block of granite –and a great number of water fountains that are interconnected by channels and water-drains perforated in the rock that were designed for the original irrigation system. Evidence has been found to suggest that the irrigation system was used to carry water from a holy spring to each of the houses in turn. Located in the first zone are the primary archaeological treasures: the Intihuatana, the Temple of the Sun and the Room of the Three Windows. These were dedicated to Inti, their sun god and greatest deity. The Popular District, or Residential District, is the place where the lower class people lived. It includes storage buildings and simple houses. In the royalty area - a sector that existed for the nobility - is a group of houses located in rows over a slope; the residence of the Amautas (wise persons) was characterized by its reddish walls, and the zone of the Ñustas (princesses) had trapezoid-shaped rooms. The Monumental Mausoleum is a carved statue with a vaulted interior and carved drawings. It was used for rites or sacrifices. 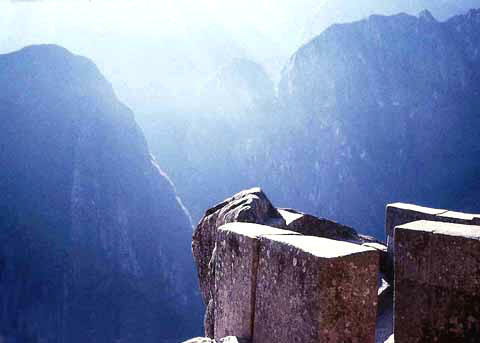 As part of their road system, the Incas built a road to the Machu Picchu region. Today, tens of thousands of tourists walk the Inca Trail to visit Machu Picchu each year, acclimatising at Cusco before starting on a two- to four-day journey on foot from the Urubamba valley, up through the Andes mountain range to the isolated city. Further evidence of Machu Picchu's role in long-distance trade comes from non-local artifacts found at the site. An example of long-distance transport is the presence of unmodified obsidian nodules from the Chivay Obsidian Source that were found at the entrance gateway to Machu Picchu by Bingham. In the 1970s, Burger and Asaro determined that these obsidian samples were from the Titicaca or Chivay obsidian source, and that these samples from Machu Picchu represent the further transport of this obsidian type in prehispanic Peru. The Guardhouse is a three-sided building with one of its long sides opening onto the Terrace of the Ceremonial Rock. This three-sided style of Inca architecture is known as the wayrona style. 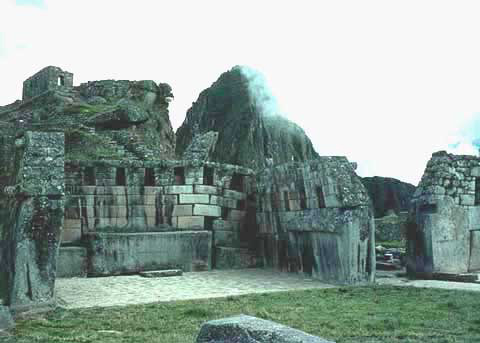 Eric Von Daniken, in his series of books beginning with Chariots of the Gods theorized that the Andean stoneworks were built by Alien/Gods who visited the earth long ago, bringing civilization to primitive man. The scientific community simply snickered. 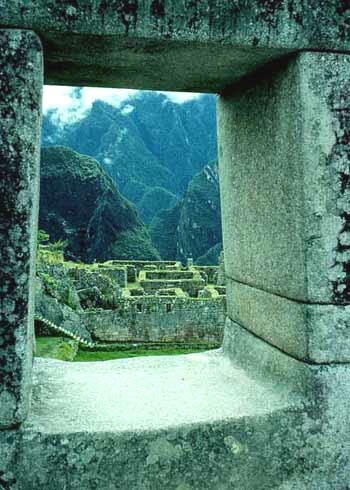 Because Machu Picchu was never discovered and ransacked by the Spanish Conquistadors, it is something of a time capsule. The stoneworks here show astonishing differences in quality of craftsmanship. In many places there are walls in the lower levels of the fine quality that is the hallmark of ancient Andean stoneworks. Then as the walls rise, the quality of work diminishes. The lower layers are always finer, always more precise, than those above. One gets the feeling that these are remnants of old walls that were discovered and built upon by later hands. © 2003-2010 by Richard Nisbet. by Richard Nisbet. Presented with author's permission. A slice of Cusco life. Mostly true stories by a gringo who has had an ongoing love affair with the town for 28 years. Funny, irreverent, adventurous, literate...the places and people of Cusco. The bars and discos, the peddlers and priests, the guides, the gurus...and the girls. 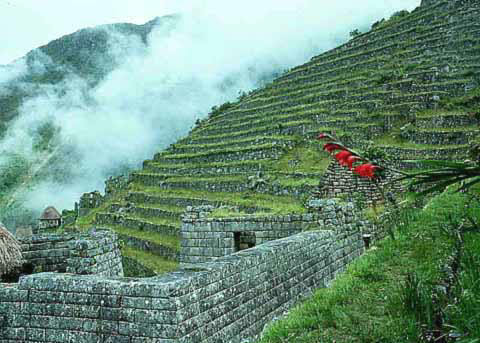 Laced throughout with Inca history as well as views of contemporary and ancient culture. Comes with a CD-ROM "The Ancient Walls"...a gallery of fotos of the Inca ruins some dating back to 1975...with commentary. More info at www.cuscotales.com Read few exerpts from this fascinating book. Davies' book on the ancient 'kingdoms' of Peru covers several key pre-Spanish cultures and civilizations in the Andean highlands -- among them Chavin, Moche, Nazca, Tiahuanaco, Huari, Chimu, and Inca -- and highlights several important archaeological sites, citing both contemporary Spanish sources and more recent discoveries. He presents a decent overview of these peoples' buildings, monuments, mythologies, and artwork in readable prose. I particularly enjoyed his discussion of the Incans, which I thought was pithy but comprehensive. In this illustrated guidebook, Peru's premiere spiritual tour guide, Jorge Delgado, takes the reader on a trip of discovery through the most powerful and mystical places on earth - Machu Picchu, the Sacred Valley, Lake Titicaca and the magical Inca doorway of Aramu Muru. Jorge Delgado was born in a small Andean village in Peru. In Andean Awakening Delgado opens the door to his mystical homeland as he describes his own journey of awakening and packs his personal narrative with fascinating details about Peru, its history, culture, mythos and magic. Delgado is our personal Quechua - a bridge person who helps others to cross from one state of conscious to another. Delgado bridges readers to the spiritual power of the Andes, of Peru and legend of the Inca - the return of the children of the light. Cataclysm: Compelling Evidence of a Cosmic Catastrophe in 9500 B. C.